I recently spent four months travelling in Central America. My initial plan was to head south from Mexico to Guatemala, travel through Honduras, and end my trip in Nicaragua. Then life happened, as it inevitably does on long trips: Honduras and Nicaragua were bumped from the itinerary, and replaced with Belize. I’d heard that food was pricey there, but miraculously, I ate cheap in Belize. Super cheap. The cheapest eats on my whole trip, in fact. As I was nearing the end of my trip — and the end of my budget — I made a conscious decision to forego real meals and survive instead solely on snacks. To my delight, the first snack found me. 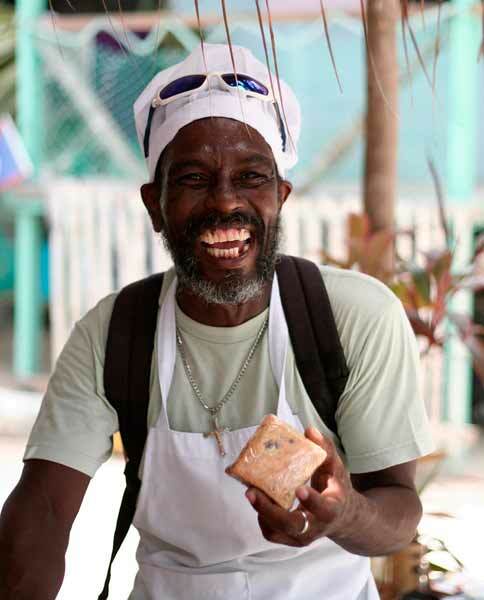 Elsworth Crawford, a native of Caye Caulker, has been baking for an impressive 28 years and sells his freshly baked treats — twice a day! — from his bicycle, which he rides across the island. Donning a chef’s hat and apron, he pedals through town, bearing a permanent grin, hawking cinnamon buns the size of your head. You’ll hear him coming: “FRESH BAKED CINNAMON BUNS! COCONUT BREAD! JUST SAY THE WORD, BAY-BAY! SAY THE WORD!” A cinnamon bun will set you back a whopping $2 BZD ($1 USD) and easily provide a day’s worth of calories. I had one most days, and don’t regret a thing. At the midway point in my trip, several locals took interest in my snack seeking. With recommendations coming at me from all sides for meat pie, Johnny Cakes and other treats, I decided to extend my stay on the island by three nights, and waited to be hungry again. Great article Marty, Thank You! I've made a list of the treats we need to sample for when we arrive on September 30, to start living in retirement on CC! !